I've waited a while to post a new blog because there hasn't been a whole lot of good things going on within the Illinois sports landscape. Well. the wait is over and it has been an epic Saturday in Champaign-Urbana. So much for a quiet first weekend in March. With barely two weeks elapsed since Josh Whitman was named the new Athletic Director of the University of Illinois, on Saturday morning, the news began to break just before 11:00 am that Illinois head football coach Bill Cubit had been fired, just a few short months after having the interim tag removed by then interim AD Paul Kowalczyk. At the time, Cubit was given a two-year contract, which led many to believe that something like this could happen. What is the perhaps the strangest development of the whole process was the timing involved. Whitman, who played football for Illinois from 1998-2001, decided to make the change on his first day removed from his last day at his previous employer, Washington University in St. Louis. The firing was made just 6 days before the start of spring workouts, but given some of the recent decisions made within the University, this was not that big of a surprise. Whitman is trying to make a splash as he settles into the job, officially taking the reins on March 21st. Along with Cubit, his son Ryan, who was the offensive coordinator, was also relieved of his duties. The other assistant coaches, four of which have been hired in the last couple of months, will be given the opportunity to interview with the new head coach, and judging from the swiftness of this decision, Whitman must already have someone in mind as a successor. So, the next question is, who might that next person be? Ever since the news broke, there have been several names leaping to the forefront of the discussion, but one name in particular, Lovie Smith, has been gaining steam. If the next coach is in fact Smith, then Whitman will make a huge statement for his first coaching hire at his alma mater. Whitman, being a football guy, has immense passion for the program, and since football is the major revenue stream for the athletic department, that program needs to be overhauled and steered in the opposite direction that it is heading. Smith has been a head coach in the NFL, both with the Bears and the Buccaneers, and would also satisfy a criteria that the university has not had before, an African-American head coach for one of the two major sports programs at Illinois. Stay tuned, because this could get even more interesting than it already has. On the court, the Illini are struggling mightily this season, just 13-17 overall and 5-12 in the Big Ten as they play their regular season finale on Sunday morning at Penn State (11:00 am CT, BTN). A win over the Nittany Lions will give the Illini the #11 seed in the upcoming Big Ten Tournament at Bankers Life Fieldhouse in Indianapolis, and an opening round matchup against Rutgers, who just won their first conference game over Minnesota. Lose to Penn State, and you are looking at the #12 seed, and a date with the Golden Gophers, who have been having even worse luck than the Illini have as of late. Regardless of who you play, it is not a viable place to be in, playing what essentially is the play-in game to the old conference tournament format. One reason Groce is returning deals with recruiting. Already on board for next season is Te'Jon Lucas, a point guard from Milwaukee that, unfortunately, broke his foot in two places playing in front of Groce (and me too, for that matter) at Parkland last month. For the 2017 class, Groce has received verbal commitments from Javon Pickett and DaMonte Williams, who is Frank Williams' son. Still in the works, and possibly could be announced in the next few weeks are Jordan Godwin and Jeremiah Tilmon, two recruits from the St. Louis area. Tilmon is playing this season at La Lumiere Prep in Indiana, the same school that produced Illini freshman Jalen Coleman-Lands. With the future of the Illinois program looking brighter from the recruiting angle, that is reason enough to give Groce the benefit of the doubt and another season. It certainly cannot get any worse. A question of judgement from new AD Whitman is why nothing has been said about the future of Illinois women's basketball coach Matt Bollant. Bollant, who saw his team falter in the Big Ten season this year, finished their season a dismal 9-21 overall, and just 2-16 in the Big Ten. What was most disturbing about the program was the scandal in the off-season involving former assistant coach Mike DiVilbiss, which ultimately led to his dismissal. Bollant had marked success at his previous stop, Wisconsin-Green Bay, but has not been able to get the Illini program even remotely close to that level. That news could come soon, later, or not at all. Again, stay tuned. It has now been three months since Mike Thomas was fired as athletic director of the University of Illinois, and whereas a decision on his successor is imminent and could be announced any day now, the athletic teams continue to struggleas a result. The frontrunners are still there, so to speak, alrhough it appears that Rick George is pretty much out of the running and Criag Tiley claims that he's never been formally contacted by campus officials. That leaves Josh Whitman and Tom Michael as the other candidates, and while both are former athletes that are currenly leading institutions in the midwest, their interest in the position remain high. Whitman, who is at Division III Washington University in St. Louis, has done a great job at that small school, and would be a viable leader at the next level. Michael is currently at Eastern Illinois and if you have been reading the news lately, is in some tough financial waters due to the state's continued fiscal woes without a budget. I've heard a lot of differing opinions over the past few weeks about these and other candidates, and nobody for sure, with the exception of the Board of Trustees, really know what is going on, and sometimes, I wonder if even they have a clue. What I do know is, the news could break any day, and when it does, you can be sure that I will be on top of it, like usual. Bill Cubit had his first Signing Day class announced last week, and even though there are not a lot of studs in the class, there are some positions of need that were addressed. As is common with coaching changes, Cubit has seen his fair share of players leave the program, most notably, T. J. Neal, who would have been one of the stalwarts at linebacker. A lot of these players that left were recruited by Tim Beckman, and now that he is gone, they feel the need to move on and play somewhere that they are comfortable. Cubit has also brought in some new coaches to the staff, and one such coach, Jeff Hecklinski, is a former Illini quarterback that has some big visions upon his return. It seems that John Groce cannot catch a break, and I use that term loosely. Groce's mens basketball team has been riddled with injuries this season, a huge part of their 11-13 overall record and 3-8 mark in Big Ten play, but it seems that the injury bug is not just affecting current players, but ones that aren't even on campus yet. I was privileged to see recruit Te'Jon Lucas and his Milwaukee Washington team take on Champaign Centennial last Saturday night at Parkland College, and for three quarters, Lucas looked like the real deal and the point guard that Groce has had such trouble landing. However, in the fourth period, Lucas was going up for a shot when he was cheap-shotted and fell to the floor. He had to be carried off the court, and it was later revealed that he broke two bones in his foot, thus ending his senior season. Groce was present at the game, and immediately went over to assess the situation. You can kind of feel for what Groce is going through, and his luck of players getting hurt borders on the unimaginable. When the new AD is hired, they will look at the full body of work, like they do with all coaches, and I hope that the injury issue is looked at carefully. That doesn't mean that the new hire won't want to make a change and bring in his own person, but if he does get let go, then everything goes back to square one and you risk losing recruits for not only this coming season, but for 2017 and beyone as well. Groce and company have made some inroads in the 2017 class, landing Javon Pickett out of Bellleville and working with others as well. A potential change could derail all of that if they are not careful. Who knows what will happen. On the womens side of things, the situation is not much better, in fact, it is getting worse. Head coach Matt Bollant has seen his team lose 14 out of their last 15 games after a 7-1 start, and at 8-15 overall and 1-11 in conference play, has got to be feeling some heat as well as the new AD hire looms. Bollant was successful at his previous stop, Wisconsin-Green Bay, and everyone expected him to come to Champaign and get the dormant program back on its feet. However, with the scandal over the summer and early fall that led to the dismissal of assistant Mike Divilbiss, they have never really recovered and are treading water as their season begins to wind down. One bright spot, center Chatrice White, continues to play well, and just imagine what she could do if she had some other players of the same caliber around her. But, it all starts with recruiting, and maybe the pundits are correct in saying that you can't build a program at Illinois. With all of the insecurity going on in the athletic program, who would want to come here? Finally, as if the athletic program doesn't need any more bad publicity, it was revealed earlier this week that softball player Ruby Rivera was charged with damaging property on campus. It seems as if most of the athletic programs on campus have some sort of issue going on with them in some way, shape, or form, and when the new AD does in fact, get hired, he or she will have quite a chore to get things back to respectability. If that even is possible. The calendar has turned over to 2016, and two things remain crystal clear on the University of Illinois campus: 1) there is still no athletic director at the university, and 2) the sports landscape, particularly the mens and womens basketball teams, is a figurative mess at the momenr. As of this week, John Groce's team sits at 9-10 overall and 1-5 in the Big Ten Conference while Matt Bollant's womens team is not much better, checking in at 8-10 overall and 1-6 in league play. So, how did these teams get so dreadful? A couple of clear reasons come to mind, although the excuses are getting a bit state, but they are still valid to an extent. For Groce, injuries have played a major part in his team's demise over the past couple seasons. Barring a miracle comeback and a deep run in the Big Ten Tournament, the Illini men will miss the NCAA Tournament for the third straight season, and Illini Nation is getting restless as a result. Yes, the injuries have been rough, but one cannot continue to dwell on those, because in basketball, like most other sports, injuries happen. Just not to the extent that Groce has seen players fall this season. Also severely hindering Groce is the fact that he has missed on too many of the top recruits, seeing them go elsewhere to further their playing experience for the next level. So, why not Illinois, you ask? The question might be better worded as Why Illinois? With the current state of the university in flux, who in their right mind would want to come here, where coaches get turned around as quickly as the student body does? After the Illini defeated Purdue a couple of weeks ago, they laid a proverbial egg against Nebraska and then got literally destroyed against Indiana on Tuesday evening, 103-69. Has there been a lower point in Illinois athletics? Is this rock bottom? If it isn't, it's as close as many ever want to see it get. The situation on the womens side of things isn't much better, as the Illini have fallen on hard times after getting out to a 7-1 start to the season. In his three plus seasons in Champaign, Bollant has seen more than his share of losing, something he wasn't used to at his last stop, Wisconsin-Green Bay. The Illini women, too, have has their share of injuries, as point guard Cierra Rice has been sidelined with an injury, and as soon as she was lost, the swoon seemed to begin. Added to that was the scandal involving former assistant coach Mike Divilbiss and the former players that claimed that racial bias occurred during practices the past couple of seasons. All of these things do not help a program succeed. Is this rock bottom for this program? Since the program hasn't attained the level of success that it had when Theresa Grentz was here, it's getting close, but not nearly as bad as in the Jolette Law era. Then, we come to the football situation, which kind of directly ties into the athletic director search a little. Head coach Bill Cubit was approved by the Board of Trustees at their meeting this week, but no move was made on the AD search, which comes as no surprise to anybody. Former athletic director Mike Thomas sort of created this situation himself with the hire of Tim Beckman, who turned out to be one of the worst decisions in modern times anywhere. Speaking of the athletic director search, there is no real concrete news to report on that, but all kinds of rumors continue to swirl around about who will be the next person to lead the athletic program. Some names of particular interest have been Rick George (current AD at Colorado), Josh Whitman (current AD at Washington University in St. Louis), Craig Tiley (former UI men's tennis coach and currently director of Tennis Australia), Sean Frazier (current AD at Northern Illinois), and Tom Michael (current AD at Eastern Illinois). All five of these potential candidates have Illinois ties, and the rumor mill has been been churning non-stop for about the past month. However, nobody knows what will truly happen, or, when it will officially occur. One thing is clear: the next AD will have some major decisions once they are in place. Keeping on the AD search subject, when Thomas was hired, he proceeded to fire Ron Zook, Bruce Weber and Jolette Law after their respective seasons were concluded, and at the time, folks in Illini Nation thought that was rock bottom. With the current state of the athletic department and the shape that the state of Illinois as a whole is in, this could challenge that as the low point in the history of the department. We shall see, because the next month will be very interesting around the Urbana-Champaign campus. 2015 was a year that most Illinois fans would love to forget, as many events happened all over the sports spectrum, leaving much indecision and speculation for the future. We begin this retrospect look back in football last February when then offensive lineman Simon Cjivanovic began a Twitter rant about his treatment, as well as others, from medical staff connected with the football team. What was originally thought to just be sour grapes from Cjivanovic and then coach Tim Beckman turned out to be much more, as an internal investigation was started that looked further into the program. After all of the dust settled, Beckman was fired just one week before the season opener, and offensive coordinator Bill Cubit was named interim head coach. 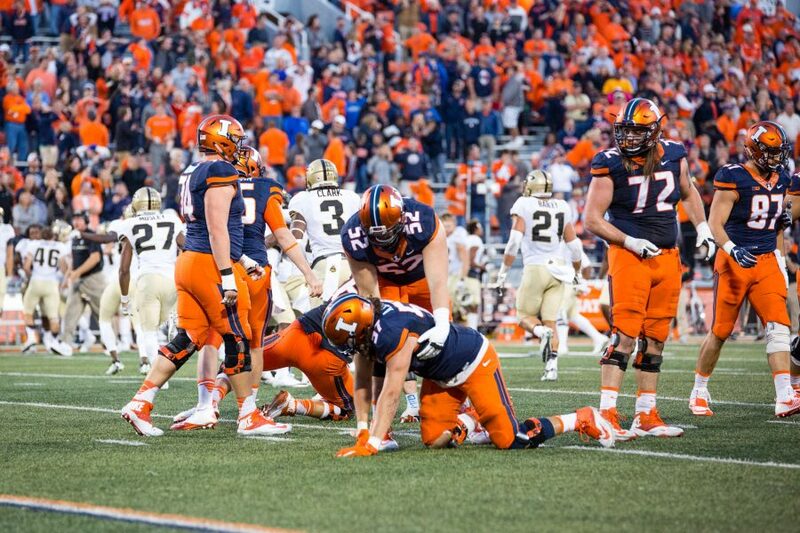 Now, before Beckman was fired, Illinois lost one of their best recievers, Mikey Dudek, to an ACL injury, effectively sidelining him for the entire season. So Cubit went on through the season as best as he possibly could, playing the hand that had been dealt to him. Illinois started off the season at 3-1 heading into their Big Ten opener at home against Nebraska. The Illini won a thrilling game against the Cornhuskers, and for the first time in quite some time, optimism bloomed in Champaign-Urbana and throughout Illini Nation. But, on the roller coaster ride that was Illinois football in 2015, there were peaks and valleys, and the peak of a 4-1 season quickly turned downward, as the Illini lost their next 3 games, including a 39-0 drubbing in State College, Pennsylvania at the hands of the Penn State Nittany Lions. That left the Illini at 4-4 heading into a game in West Lafayette against a Purdue team that was struggling mightily themselves. Illinois won the game 48-14, and the peak rose just a bit knowing that they were only one win away from becoming bowl eligible. To complicate matters, the following Monday, Athletic Director Mike Thomas was fired without cause by interim chancellor Barbara Wilson, and Paul Kowalczyk was named interim (there's that word again) AD for the remainder of the season. What followed next was typical Illinois, as they lost their final 3 games of the season to finish the regular season 5-7. Before the Illini's final regular season game, a "home" contest at Soldier Field in Chicago (go figure), Cubit was given a 2 year extension by interim AD Kowalczyk, a move that still has people shaking their heads about. Despite the 5-7 record, Illinois still had a chance to become bowl eligible, due to the lack of teams with the 6 wins to fill bowl slots. This is pure evidence that there are too many bowl games. Ultimately, Illinois was not selected, due to the criteria of the APR (Academic Performance Rate) not being high enough. This fell totally in line with everything that happened during the season, and truth be known, Illinois didn't deserve a bowl berth in the first place. Now switching to the mens' basketball program, we find even more bizarre events. We rewind back to early March for this portion, when Illinois traveled to West Lafayette to battle Purdue with an NCAA Tournament bid well in sight. Illinois played well for the first half, but fell apart in the second half, and lost the game, as well as it turned out, momentum heading into the Big Ten Tournament in Chicago. Illinois drew Michigan in the first round, and were utterly destroyed in that game 73-55, thus ending any speculation that the Illini would make the NCAA field of 68. Instead, Illinois made the NIT, and due to ongoing renovations at the State Farm Center (more on that later), had to play on the road at Alabama. Once again, Illinois pretended to play basketball against the Crimson Tide, losing badly 79-58 to finish the season a very disappointing 19-14. However, that was only the tip of the iceberg, as the off-season brought even more head-scratching moments. Illinois was granted an overseas trip during the summer, which was in France, and included the freshmen and transfers. One such transfer, Darius Paul, was given a second chance by head coach John Groce, and once again could not stay out of trouble, and was asked to leave France ahead of the rest of the team. This effectively ended Paul's involvement with the Illinois basketball team, but the chain reaction of events was far from over. Groce has been widely critized for not being able to recruit a point guard and a big man, and after several unsuccessful overtures by high level prospects spurning the Illini for other schools, Groce was left to settle for two fifth year transfers, Khalid Lewis and Mike Thorne Jr. to fill the void. To make matters worse, senior guard Tracy Abrams, who was coming back from an ACL tear the season before, tore his Achilles and therefore, was sidelined for this season as well. Abrams has had some very unfortunate luck, but with everything going on within the program, it didn't surprise many. Before the season began, Illinois began a series of injuries to players of differing degrees. First, incoming freshman Jalen Coleman-Lands was dealing with an injury, followed by in no particular order, Jaylon Tate, Kendrick Nunn, Leron Black and Aaron Jordan taking their turn nursing various ailments. Once the season began, the Illini had to play away from Champaign for the first 5 games of the regular season due to State Farm Center renovations. The venue that was chosen for their "home" arena was the Prairie Capital Convention Center in Springfield, a far cry from the State Farm Center, but home nonetheless. Illinois didn't play very well at the PCCC, losing to North Florida and Chattanooga over there ,and needing a last second three-pointer from Coleman-Lands to beat powerhouse (I kid) Chicago State. Just when you thought things were getting back to normal, well, things took another turn southward. First Black came back, but was clearly not the same and soon went on the shelf again. Then, it was Thorne's turn to tear his meniscus, and the lack of the big man in the paint really began to handcuff the Illini. As if things couldn't get any worse, Lewis contracted Mumps shortly after Christmas, and missed a couple games, and as recently as Thursday of this week, it was announced that Kendrick Nunn didn't make the trip to Michigan State because he stayed back in Champaign to witness the birth of his first child, who made his entrance into the world shortly before tipoff. This doesn't even begin to cover the scandal into the womens' basketball program, as well as the alleged abuse to a women's soccer player. Sure, there have been some good things that happened in 2015, such as the Illinois baseball team qualifying and hosting both a regional and a super regional, as well as wrestler Isaiah Martinez continuing to dominate opponents. I can't make this stuff up, folks. As a freelance writer and Illini correspondent, I have had the unenviable task of being front and center for a good majority of these happenings, and in all my years of watching and covering Illinois sports, I have never seen anything like this. This would make a perfect movie script, and if you would have approached anybody a year ago with a proposal such as this, anybody would have thought you were crazy. I really can't envision 2016 starting off any better, as the mens' basketball team currently sits at 8-8 overall and 0-3 in the Big Ten, while the women are 8-7 overall and 0-3 in conference play as well. However, one positive in all of this: The State Farm Center renovation looks really nice. Here's hoping that future recruits think that way too, and want to come here and change the direction of the program.